… and welcome to Great Bakes! Your search for the perfect gift is over, say Happy Birthday, Good luck or simply Thank you with a delicious tin of Great Bakes. Why not send your loved ones our unique creation, Stickyjack a fabulously indulgent and outrageous combination of oats, sticky caramel and dark chocolate. Think millionaires shortbread meets flapjack! 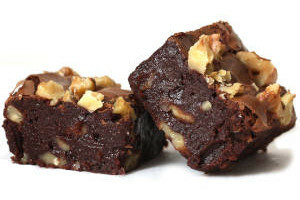 Take your pick from our range of wickedly rich and moreish brownies all generously crammed with fabulous dark Belgian chocolate to create a heavenly, fudgy chocolate treat. All Brownies are available Gluten Free. Here in the Great Bakes kitchen all our gorgeous goodies are made by hand. Chocolate is melted into sweet flowing unctuous rivers, eggs are whisked to fluffy clouds and sugar is transformed into molten golden caramel. Every order is baked fresh and once out of the oven and cool, they are cut (often a little unevenly!) wrapped, tied and packed in a neat, stay-fresh storage tin. Even your personal gift message is hand written resulting in a truly artisan Great Bake. Keep your Great Bakes tin and next time, order a refill. All our products are available simply wrapped and ready to pop into your tin, all of the goodness just with a bit less packaging. Perfect as a treat for yourself! Click on our products to discover more about our brilliant bakes. They make the perfect present for every kind of occasion and trust us; you’ll earn major 'brownie' points when you send them!